Sometimes you have to go backward before you can clearly see how to move forward. For Guy and Jennifer Genis, renovating a midcentury modern home meant returning to its roots. Their goal: to unearth the original design features while endowing the space with ease and comfort. “I wanted simplicity and warmth, not a museum where you had to tread lightly or worry about the kids,” says Guy, who bought the 3,500-square-foot house in Sherman Oaks, California, because it reminded him of his own childhood vacation home. Moving from concept to reality, however, required an archaeological dig of sorts. The previous owners, who had built the home in 1960, buried many of its attributes under decades of evolving design trends. “The den was covered in crumbling wall-to-wall mahogany paneling,” says Bryan Wark, an interior and event designer who collaborated with Guy and Jennifer on the yearlong transformation. A massive gold-veined mirror concealed an unfinished double-sided fireplace; plantation shutters blocked an enormous expanse of floor-to-ceiling windows. A team of workers had to chip away for days on their hands and knees to unearth the original terrazzo floors. Once the fundamental features were uncovered, the decorating began. Against the sand-colored terrazzo floors, Wark used a limited palette of neutrals with touches of red in the living room, moving into a series of chocolates and creams in the den and bar area. He also pared down the amount of furniture and artwork. “I didn’t want to overcrowd rooms ― I wanted to emphasize their scale instead. We talked endlessly about embracing negative space,” Wark says. The designer chose a handful of dramatic pieces to stand out against quieter elements. A pair of towering vintage majolica lamps in the living room creates a yin and yang effect atop an understated low credenza of wenge and white CaesarStone (a quartz-polymer material). The intricate pattern of each lamp base is echoed in the legs of the black Asian altar table across the room. The mix of items from another era with midcentury classics and some contemporary pieces keeps the overall look anchored to the home’s origins while adding individual style. “Modern architecture can be quite cold, so we aimed to downplay that effect,” Wark says. Having multiple spaces for entertaining at home was important to Guy, who is CEO of event production firm Eventmakers. But the real focus was on creating an intimate gathering place for the family. Evenings are often spent in the den, with Guy reading on a Bertoia chair at the bar, Jennifer working a crossword on Wark’s custom suede sofa, and 3-year-old Stella bouncing up and down in the Eames lounger. Design: , West Hollywood, CA (310/858-8640). Full of lush details and patterned geometry, Guy and Jennifer Genis’s home is nonetheless a study in effective restraint. Here are four ways to create a rich environment without visual overload. Balance opposing elements. “The entire house is a play between light and dark, texture and pattern,” says Bryan Wark, who studied sculpture before becoming a designer. 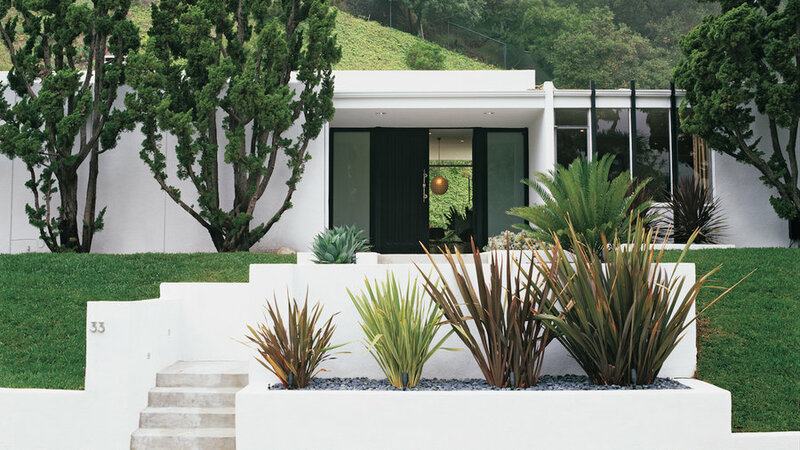 The contrast is introduced early on with the graphic agave and phormium plantings at the front entrance, accentuating the simplicity and clean lines of the exterior white stucco. Provide textural interest without overwhelming the eye. In the bar area, white-on-white wallpaper leads to tobacco-colored hemp cloth (Kneedler-Fauchère, 310/855-1313) on the den walls. A white shag rug and Wark’s chocolate suede sectional provide subtle visual stimulation and a soothing backdrop. “Whether it was wallpaper, textiles, ceramics, or accessories, our choices were always guided by the principle that less is more,” Wark says. Think along different lines. In the den, the dark brown tiles chosen by Guy pack a bold punch when laid vertically to emphasize the height of the fireplace. They also make a pleasing juxtaposition to the surrounding horizontal wall tiles and custom cabinetry. Unify collections by grouping similar colors and forms. “Repetition creates cohesion and a calming effect,” Wark says. The display shelf of white ceramic figurines and vases in the den strike a whimsical note with the addition nearby of a pair of white coral-inspired sconces ( , 310/278-2456). In the living room, the black altar table ( ) picks up the pattern on the lamp bases.